Many daily actions, like taking the bus, following street directions, or getting ready to complete a task, can be challenging for children and teenagers with an intellectual disability which makes it difficult for them to understand the requests of the outside world. 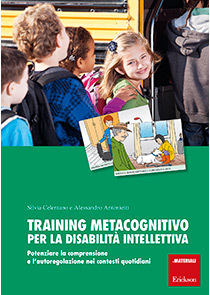 The training proposed in this book is intended to support and strengthen the ability of comprehension through a metacognitive approach, which allows one to face daily experiences with greater awareness, emotional self-regulation and autonomy. In the worker’s guide, after a brief theoretical overview, the methods of the course are presented in detail, while the appendix contains 26 colour charts, with texts and illustrations of the investigations. Designed to be used in schools, rehabilitation centres and at home, the training is aimed primarily at children aged 10 to 16 with mild intellectual disability or limited intellectual functioning. CH. 2 Training "Let's not lose our minds!"